Compressed. Cooked. No. 1 in America! Ready to serve. Libby's Quality: We take pride in providing you with only products of the finest quality. Libby's fine quality Corned Beef Is fully cooked and ready to serve chilled or heated. 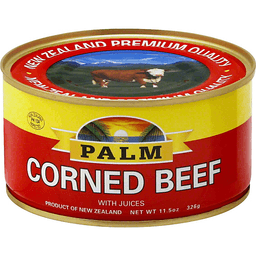 Serving Suggestions: Corned Beef is easier to slice when thoroughly chilled. It may be sliced and fried, crumbled or cubed: and added to salads, casseroles, scrambled eggs or cooked potatoes. Packed under Brazilian Government inspection. Product of Brazil. New Zealand premium quality. New Zealand inspected. Product of New Zealand. 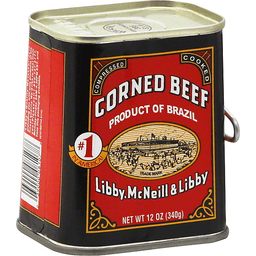 Libby's® Corned Beef with Onions. New. 130 Calories per 2 oz serving. Net Wt 12 oz (340 g). Libby's Corned Beef with Onion is fully cooked and can be browned and crumbled into a salad or casserole. 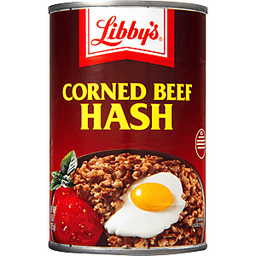 Serving suggestions: Serve it with eggs and potatoes for a delicious spin on your favorite Corned Beef Hash! Please recycle. Please have entire package available when you call so we may gather information off the label. Questions or Comments, Call 1-800-727-5777 Mon.-Fri., 9:00 AM-7:00 PM (CST) (except national holidays). 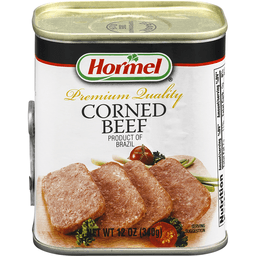 25% less sodium than regular canned corned beef. Ready to serve. 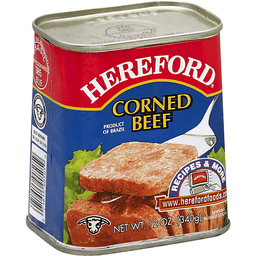 Hereford Corned Beef is fully cooked and ready to serve hot or cold in sandwiches, tacos, salads, casseroles; with eggs or potatoes. 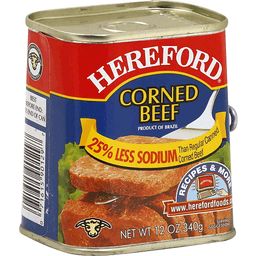 Sodium content has beef lowered from 549 mg to 411 mg per serving.